Medical school dark side: The third year makes students less empathetic. Students come in altruistic and empathetic. They leave jaded and bitter. Next month, your future doctor will take the first steps into clinical medicine. I am not talking about the first day of internship (though that also happens on July 1), but the monumental transition that medical students make at the halfway point of medical school from the classroom years to the clinical years. After two years of the predictable life of lectures, textbooks, and exams, the students are plunged into the world of actual clinical medicine, where patients and their illnesses rarely go by the book. It is the moment these students have been waiting for. One would think that the third year of medical school would be a crowning achievement—the donning of the white coat, the grasping of the golden ring after many years of striving. And in some ways it is. The learning curve is voraciously steep as students soak up clinical knowledge at an impressive rate. However, there is a darker side of this transition to clinical medicine. Many of the qualities that students entered medical school with—altruism, empathy, generosity of spirit, love of learning, high ethical standards—are eroded by the end of medical training. Newly minted doctors can begin their careers jaded, self-doubting, even embittered (not to mention six figures in debt). In researching my book What Doctors Feel: How Emotions Affect the Practice of Medicine, I discovered that the third year of medical school is when these high-minded traits begin to erode, an observation that won’t come as a surprise to anyone who’s been through traditional medical education. For starters, the entry into the clinical world can be an intensely disorienting experience. Complications, drug interactions, patient idiosyncrasies, medical errors, insurance issues, and emergencies keep life frenetic. Everything—from the smell of infected bedsores and the insistent clanging of alarms to the foreign language of hospital lingo and the capriciousness of death—serves to create a disconcerting world. In the midst of this are the greenhorn medical students, acutely aware of their lack of practical skills to do anything of use. And as soon as students have figured out the ins and outs of the electronic medical record system, the names of the social workers, and where the bathrooms are, they are shipped off to the next rotation—in a different place, with a different medical team, with different patients, with different expectations, and often an entirely new computer system to battle with. Every four to eight weeks, the students are whisked through a new world: surgery, internal medicine, obstetrics-gynecology, psychiatry, neurology, pediatrics, and outpatient medicine. This ensures that students have a good grounding in the broad field of medicine, but it also ensures that any relationships formed—with patients, nurses, senior physicians, or mentors—are serially disrupted. It’s no wonder that so many students spend the year in a daze. Students are not just learning medicine during the third year of medical school; they are learning how to be doctors. Despite the carefully crafted official medical curriculum, it is the “hidden curriculum” that drives the take-home messages. The students astutely note how their superiors comport themselves, how they interact with patients, how they treat other staff members. The students are keen observers of how their supervisors dress—and how they may dress down those around them. They figure out which groups of patients can be the object of sarcasm or humor, and which cannot. On a daily basis, the students witness fear, anger, grief, humiliation—in patients and doctors alike—all of which are largely unacknowledged. They see egos rubbing up against each other, hierarchies at play, bureaucracies in action. They observe that many of the niceties of patient care fall prey to the demands of efficiency and high patient turnover. Much of what they learned about doctor-patient communication, bedside manner, and empathy turns out to be mere lip service when it comes to the actualities of patient care. It’s no wonder that the third year of medical school figures prominently in studies that document the decline of empathy and moral reasoning in medical trainees. But the beginnings of clinical medicine should be a time of awe and enthrallment, not a time of hardening. It is, after all, the moment of stepping into the flesh and blood of medicine. Of course it is not all misery and cynicism; third-year medical students gain immense knowledge, and many find positive role models. But the ice-water plunge into these primal clinical experiences produces a welter of emotions. A small but burgeoning field of research suggests that these emotions profoundly affect what kind of doctors these students become and the quality of medical care they can give to their patients. The erosion of empathy, for example, may have long-reaching consequences. Patients of doctors who score lower on tests that measure empathy appear to have worse clinical outcomes. Diabetic patients, for instance, have worse control of their blood sugar and cholesterol. Cancer patients seem to experience more depression. Medication compliance diminishes. Even the common cold can last longer. These subtle qualities—moral judgment, empathy, compassion—are by nature much more difficult to study than fact-based medical knowledge, which is why our current assessment of doctors’ competence remains largely a multiple-choice-testing affair. 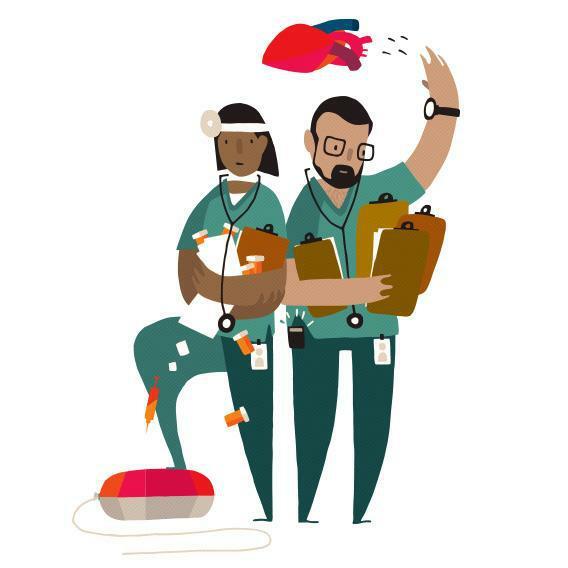 But to ignore the seismic emotional experiences of medical training risks chipping away at the very qualities that distinguish great physicians from the merely competent. Medical schools are beginning to take notice of the third-year slump. More attention is being paid to consistent mentorship. Clinical exposure is being introduced earlier, mixing in with the classroom part of medical school. Weeklong “inter-sessions” at NYU gather students together between third-year clerkships to reflect on the tangle of medical experiences and offer time to teach the subtler aspects of medicine. Some schools, such as the University of California, San Francisco, and Harvard, are reworking the third year altogether, attempting to integrate all the clerkships into a yearlong coherent clinical experience. Medical education, however, is a slow-moving beast. The most recent revolution occurred in 1910, when Abraham Flexner issued a scathing report on the lack of scientific standards in American medical education. Since then, rigorous biomedical education has appropriately been the basis of medical school. But students are not databases; you can’t just stuff medical knowledge into them and expect to produce doctors at the other end, especially when that process coarsens the very qualities that inspired students to enter medicine in the first place. The average smartphone, after all, can access reams of medical facts more quickly and probably more accurately than our trusty neurons. And while there might be a few people out there who’d entrust their health to their iPhones, most of us would prefer to be cared for by actual human beings, especially those with wisdom and empathy in addition to knowledge.